2008/2007 International Wine & Spirit Competitions. Silver Medal (Best in Class). Traditional Irish Whey Distillate. Distillate. The Traditional Irish Whey Distillate results in a totally unique and remarkably soft delivery of the spirit on the palate, and an outstanding smooth finish. 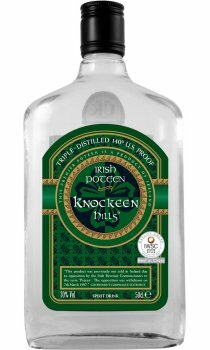 Knockeen Hills has achieved outstanding provenance as they are the only Irish Poteens produced, using Irish Whey dIstilled spirit. Nose. Hint of melon and vanilla, followed by an olive flush. Yielding wild thyme, lemon zest and slightly balsamic to the nose. Taste. It is quite warm on ice, and refreshingly easy to drink, and more so than vodkas of lesser strength. Irish triple-distilled spirit provides an easy tasting drink with a variety of fruit juices and mixers. The additional strength as compared to the Farmers 60% vol. provides a noticeably exceptionally smooth substitute for main line spirits such as gin, tequila, rum vodka and whiskey, taken with usual mixers where appropriate. Outstanding as a contemporary cocktail base. Finish. Strong, crisp though particularly smooth..
Overview. It is a stronger version of the Farmers Strength 60% vol, and will appeal to those who are used to drinking strong, though smooth spirits. It has much of the characteristics similar to the Farmers Strength, though a much more intense taste, but surprisingly no after-burn! In 1997 the illegal status was removed by the Irish Government. In 2007 the EU conferred 'Geographical Indicative' protective status to Irish Poteen. Irish Poteen has been produced for several centuries and for nearly the last 300 years has been referred to as Ireland's Moonshine spirit. It achieved notoriety when home production was made illegal during the reign of Oliver Cromwell, to coerce the Irish population to buy inferior Crown Whiskey which had high taxes, to pay for the English costs of its war against Ireland and its occupation. In the 15th and 16th Century, Crown Agents, and in later times the Garda, could impose heavy fines and confiscate farm machinery where sacks of grain or barley were found that they decided were intended to be used to produce a mash and subsequently poteen. Avoiding any of these tell-tale signs that poteen was being produced and with it the risk of prosecution/fines/imprisonment, meant producers could work more freely without worry. Therefore, as no cow was ever known to have been confiscated, hence its milk was frequently used in the spirit making process, and our poteens follow that centuries old tradition. Kosher Properties: : All contents meet the requirements for being considered Kosher, except for Passover. For the strength of this spirit I found it surprisingly smooth and easy to drink without leaving you with that feeling as if you had just drunk meths! Its subtle flavour meant it went down well either neat or as a mixer. I would air on caution when unleashing it at a party or barbeque as it doesnt take much for things to turn rather "merry"!